During the summer of 1978, ten years after the events this book recounts took place, I was nine years old. We had a neighbor, who lived in a trailer, that was nice to me. I was a latchkey kid, so I’d take the bus home from school, and when my parents were at work, he’d toss the football to me, his wife would give me cookies, that kind of thing. One day I asked him about an old photo on his wall of a group of Army men, standing all covered in dirt, holding guns in front of a helicopter and he pointed out one of them and said it was him. He pulled out an old photo album and while I sat mesmerized by the photos told me a little bit about the Vietnam War. Toward the end, there was a photo of a helmet with a big dent on one side, and he explained that was where he’d been hit by a mortar, a dud that glanced off the side of his head, knocked him out cold, and he woke up in a hospital bed. That was his ticket home. A buddy had taken a photo of the helmet and sent it to him. They’d thought he was dead. That story sparked my fascination with the war in Vietnam. My mom ordered me a collection of hardcover books, I think from Time Magazine, that covered the entire war. A new one would come each month, and I would open it and look at the photos and read the captions and the stories from cover to cover. The last book in the collection arrived long after that Veteran had moved from the trailer. I remember wishing he was still there so I could ask questions that arose from the photos. He’d called himself a “Tunnel Rat” and his unit, was something like the “Wolf Pack” or “Wolf Hounds.” I’ve never been able to track him down to thank him for those days he’d toss the ball to me, and how he shared with me those personal photos and the stories he told me or how, in a way, he inspired me to tell those stories. 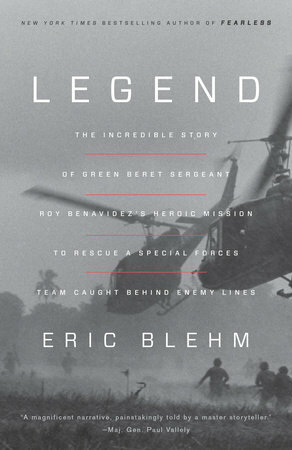 So, in addition to the men who fought the secret war, and the air assets who supported their missions, I’d like to dedicate the paperback publication of LEGEND to that neighbor. In this book, I researched and found some of the answers to the questions I had for him, and through one mission, that occurred during the year I was born, was able to honor him and so many others for their service and sacrifice during the Vietnam War.